For the pre-war car of the same name, see Triumph Dolomite (pre-1940). The Triumph Dolomite is a small saloon car produced by the Triumph Motor Company division of the British Leyland Corporation in Canley, Coventry between October 1972 and August 1980. The Dolomite was the final addition to Triumph's small-car range (codenamed "Project Ajax"), which had started in 1965 with the Triumph 1300. Designed to be a replacement for the rear-wheel drive Triumph Herald, the 1300 was originally fitted with a 1,296 cc (79 cu in) engine and front-wheel drive. The later model, introduced in September 1970 as the Triumph 1500, featured a remodelled front and rear, styled by Michelotti, and a larger 1,493 cc (91 cu in) engine. Triumph were however dissatisfied with the market performance of the 1300; although it had been moderately successful, the higher price and greater complexity meant sales never reached the levels of the simpler and cheaper Herald which preceded it. In an attempt to improve matters, the car was comprehensively re-engineered. Launched in September 1970, the Triumph Toledo was a cheaper and more basic variant of the 1300, but with conventional rear-wheel drive. This new model was assembled alongside the now larger-engined front-wheel drive version (the Triumph 1500) which was launched at the same time as the Toledo. Designed as the successor for the upmarket variants of front-wheel drive designs, and also to replace a sporting relative of the Herald, the six-cylinder Triumph Vitesse, the Triumph Dolomite was unveiled at the London Motor Show in October 1971. However, due to a number of strikes and other industrial upsets, the car was not reported to be in full production until October 1972. The name "Dolomite" had been used by Triumph for a range of models prior to the Second World War and this was revived for the new car. The Dolomite used the longer bodyshell of the front wheel drive Triumph 1500, but with the majority of the running gear carried over from the rear-wheel drive Triumph Toledo. Initially, the only version available used the new slant-four 1,854 cc engine, which mated an alloy overhead cam (OHC) head to an iron block, providing 91 bhp (68 kW) which offered sprightly performance. This was a version of the engine that the company was already providing to Saab for use in their 99 model. The car was aimed at the new compact performance-luxury sector, vying for sales against cars such as the BMW 2002 and Ford Cortina GXL, and was offered with a high level of standard equipment, including twin headlamps, a clock, full instrumentation, luxury seats and carpets, a heated rear window, and a cigar lighter. Styling was similar to the Triumph 1500, with some updates such as a black painted rear panel, vinyl D-posts, and new wheel trims. The car was capable of 100 mph (160 km/h), with 60 mph (97 km/h) coming up in just over 11 seconds. An overdrive gearbox was soon made available as an option and there was also an optional automatic transmission. Although the Dolomite proved to be refined and rapid, competitors such as the BMW 2002 had a performance advantage which was costing Triumph dearly, both in terms of sales and prestige. To remedy this, Triumph unveiled the Dolomite Sprint in June 1973, although the launch had been delayed by a year; it had been due to go on sale in 1972. 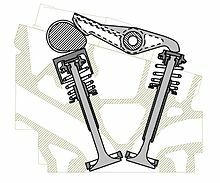 A team of engineers led by Spen King developed a 16-valve cylinder head with all of the valves being actuated using a single camshaft rather than the more conventional DOHC arrangement. The capacity was also increased to 1,998 cc (122 cu in), and combined with bigger carburettors the output was upped to 122 lb⋅ft (165 N⋅m) at 4,500 rpm and 127 bhp (95 kW) at 5,700 rpm. This represented a significant power increase over the smaller 1850cc variant, however it fell short of the original target of 135 bhp (101 kW). Despite BL engineers being able to extract a reliable 150 bhp (112 kW) from test engines, the production line was unable to build the engines to the same level of quality, with production outputs being in the region of 125 bhp (93 kW) to 130 bhp (97 kW). This led to the original model designation, the Dolomite 135, being replaced at short notice with the Sprint name. As a result of the use of this engine, the Dolomite Sprint has been claimed to be "the world's first mass-produced multi-valve car". While other multi-valve engines (notably the Lotus 907) were produced in volume, they were not used in mass production vehicles until after the introduction of the Dolomite Sprint. The design of the cylinder head won a British Design Council award in 1974. Performance was excellent, with 0–60 mph taking around 8.4 seconds, with a maximum speed of 119 mph (192 km/h). Trim was similar to the 1850, with the addition of standard alloy wheels (another first for a British production car), a vinyl roof, front spoiler, twin exhausts and lowered suspension. The seats were now cloth on the 1850, and these were also fitted to the Sprint. Due to the increase in power brought by the new engine, the rest of the driveline was upgraded to be able to withstand the extra torque. The gearbox and differential were replaced by a version of those fitted to the TR and 2000 series cars, albeit with a close ratio gearset in the gearbox. The brakes were upgraded with new pad materials at the front, and the fitment of larger drums and a load-sensing valve at the rear. Other changes over the standard Dolomite included the option of a limited slip differential. The optional overdrive and automatic transmissions from the 1850 model were also offered as options on the Sprint. Initial models were only offered in "mimosa yellow", although further colours were available from 1974 on. ...the Sprint must be the answer to many people's prayer. It is well appointed, compact, yet deceptively roomy. Performance is there in plenty, yet economy is good and the model's manners quite impeccable ... Most important of all, it is a tremendously satisfying car to drive. A press release dated May 1973, from BL's public relations department, states "To acknowledge the Dolomite Sprint's performance the Triumph sports car colour range will be used, with the first 2,000 cars finished in Mimosa with black trim. Other distinguishing features are a black simulated leather roof covering, contrasting coachlines along the body and new badges." From May 1975 on, overdrive and tinted glass were standard. In addition, all Sprints were fitted with body side trims, a plastic surround for the gearlever, and a driver's door mirror. Headrests were now available as an optional extra. From March 1976 headrests, a radio, and laminated windscreen were standard. In 1978, laminated windscreens became a standard fitment and in 1980, to comply with UK legislation, twin rear fog lamps were also standard. As with many other British Leyland cars of the period, a number of "special tuning" options were available for the Dolomite Sprint, offering dealer fitted upgrades to the car that included larger carburettors, freer flowing exhaust systems, and competition camshafts. These upgrades were designed by the factory race team and offered in order to homologate the tuning parts for competition purposes. In 1977, a number (probably 62) of Triumph TR7s with the same Sprint engine were manufactured as pre-production cars at Speke, Liverpool. However, this Triumph TR7 Sprint variant was cancelled with the closure of the Speke assembly plant in 1978. By the mid-1970s the range had become complex, with a large number of models and specifications. The Dolomite bodyshell was still being made as the basic Toledo (short boot bodyshell, 1,296 cc (79 cu in) OHV, rear-wheel drive), the 1500 TC (standard bodyshell, 1,493 cc (91 cu in) OHV, rear-wheel drive) and the Dolomite/Dolomite Sprint (Standard bodyshell, 1,854 cc (113 cu in) / 1,998 cc (122 cu in), OHC, rear-wheel drive). The Dolomite 1300 used the 1,296 cc (79 cu in) Standard SC engine from the Herald and Spitfire, and replaced the Toledo as the basic model in the range. The body was identical except for the lengthened body which gave the larger boot of the original Dolomites. The 1300 retained simplified fittings, including single, square, headlamps, basic instrumentation and seats, with the wooden dashboard and carpeting of the Toledo. There was no two-door option as there had been for the Toledo, and the shorter-boot bodyshell of the Toledo ceased production. Standard equipment included reclining front seats, cigar lighter, "fasten seat belt" warning light, driver's door mirror, twin reversing lights and a dipping rear-view mirror. The dashboard design was the same as that fitted to the facelifted Toledo of 1975. There was no overdrive or automatic transmission option with the 1300. The next model up, replacing the Triumph 1500 TC, was the Dolomite 1500. The Dolomite 1500 offered identical specifications to the Dolomite 1300, but with a 1,493 cc (91 cu in) engine and twin carburettors. Overdrive and automatic transmissions were offered as optional extras. The 1500HL had essentially identical specification to the luxury 1850 (now designated 1850HL), but again featured the 1,493 cc engine. Performance was good, and once again overdrive and automatic transmissions were optional. The HL model had an improved specification level over the standard Dolomite 1500 including a rev counter, volt meter, separate fuel and temperature dials, clock, adjustable steering column and driver's-seat height adjust, head rests, front seat rear pockets, rear centre arm rest and walnut door cappings on all four doors. The new 1500 models replaced the previous front-wheel drive layout with rear-wheel drive, with few external differences apparent in the bodywork. At a time when most manufacturers of smaller cars were concentrating on front-wheel drive cars, this change was widely considered somewhat backward thinking. However, the otherwise completely rear-wheel drive model lineup at Triumph meant that switching to rear-wheel drive would afford significant cost savings. History repeated itself almost 30 years later when MG Rover, a descendant of the British Leyland company that owned Triumph, converted the Rover 75/MG ZT model to rear-wheel drive. The Dolomite changed very little (in all its variants) from the beginning to the very end, only minor trim differences and additional standard equipment being the main changes. 1979 saw the introduction of the Dolomite SE, of which 2,163 were built. The bodyshell was of the basic 1500 (single headlamps) but the interior was fitted with luxury trim including burr walnut dashboard and door cappings (the dashboard was the same style as fitted to that of the Dolomite 1300), grey velour seats and matching carpet. All the cars were painted black with wide silver stripes running full length, with the letters "SE" at the end of the rear wing. The SE also sported a front spoiler and Spitfire style road wheels. By the late 1970s the Dolomite was looking increasingly old fashioned against newer competition, though still popular. Designer Giovanni Michelotti delivered a promising new design (Sprint based) and resembling a Fiat 132 with a squared front and BMW style 'kink'. At least one full-size example was built. With severe problems at BLMC, management refused, there was simply not enough money. Production continued until August 1980 when BL closed the Canley Factory as part of a restructuring process which also resulted in the closure of the MG factory at Abingdon two months later. The Dolomite was replaced a year later by the Triumph Acclaim, a four-door front-wheel drive family saloon produced in a joint venture with Honda. However, the Acclaim was not a sporty model, designed instead to compete with traditional family saloons, although it did manage strong sales on British market. This kept the marque alive until 1984 when the Acclaim was replaced with the Rover 200 and the Triumph Motor Company passed into history. The Dolomite became a fairly rare sight on British roads with only about 1300 roadworthy examples registered in the UK with 300-400 16 valve Sprints in 2009. This is favourable when compared to other contemporaries such as the Morris Marina, of which fewer than 800 examples out of 953,576 produced were still roadworthy, despite the Marina being a stronger seller than the Dolomite. They have a popular following throughout Europe and Australia, where Sprints were imported between 1975 and 1978, and raced at Amaroo Park, and the famous Bathurst 1000. A small number of Dolomites including the Sprint variation were also imported into New Zealand during the original production run. 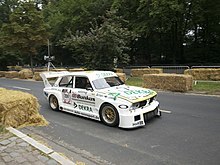 The Dolomite Sprint was campaigned in the British Touring Car Championship from 1974 to 1978. It met with some success, with Andy Rouse winning the Drivers' Championship in 1975, and also lifting the manufacturer's title in 1974 with team mate Tony Dron. The Sprint driven by Andy Rouse and Tony Dron managed fifth overall in the Spa 24 hours race in July 1974. In September Dron managed 3rd place overall in a Sprint competing in the RAC Tourist Trophy race of that year. In 1975 Andy Rouse won the British Touring Car Championship outright by taking the driver's title in a Sprint. In 1976 Broadspeed only ran one Dolomite Sprint in British Saloon Car Championship, with Rouse finishing second in the two-litre class. 1977 saw the departure of Rouse and the return of Tony Dron as driver of the Broadspeed prepared Dolomite Sprint. Dron won no less than seven of the twelve races outright against some stiff competition, and narrowly missed out on winning the championship outright because of tyre failure on the final race when leading his class by over a minute. In 1978 Broadspeed entered a sole Dolomite Sprint (driven by Tony Dron) where it won only one race outright, although the Sprint still won class B in the last year a factory entered Sprint would compete in the British Saloon Car Championship. Due to the heavier bodyshell and somewhat fragile engine, the Dolomite Sprint was less successful in rallying. Retirements were rather frequent resulting in failure to complete any rallies during 1974. Things improved slightly in 1975 when a Sprint crewed by Brian Culcheth and Johnstone Syer finished 11th overall in the Welsh Rally in May 1975 (FRW 812L). This was quickly followed up with an impressive second place overall in the Tour of Britain in August 1975, and in the 1975 Lombard RAC Rally Culcheth and Syer won Group 1 and were first in class. In January 1976 Tony Pond and D. Richards won Group 1 in the Tour of Dean Rally. In the same month, Culcheth and Syer finished fifth overall in the Snowman Rally, and seventh overall in the Mintex Rally a month later, with Tony Pond and D. Richards coming first in Group 1. Culcheth and Syer had to retire in the Granite City Rally held in March, while Pond and Richards came home fourth overall and finished first in Group 1. Culcheth and Syer finished second overall in the Tour of Britain and in the Manx Trophy Rally held in August, while P. Ryan and F. Gallagher came in ninth overall. P. Ryan and M. Nicholson also came first in Group N in the Lindisfarne Rally held in October, and they also came second in Group 1 in the Castrol '76. From May 1976 onwards, the Dolomite Sprint would run alongside the TR7 before being eventually withdrawn from rallying, the TR7 V8 taking over the mantle. In the Lombard RAC Rally of 1976, the Sprint was forced to retire with engine problems. 1977 would be the last season where factory entered Sprints would compete in any form of rallying. Ryan and Nicholson managed to win Group 1 while coming eighth overall in the Granite City Rally, and this was followed by ninth overall in the Welsh Rally and finishing second in Group 1. The Scottish Rally saw Ryan and Nicholson come 12th overall and helped win the team prize with two other TR7s. The Manx Rally held in September 1977 was the very last rally where a works-entered Sprint was entered, but it ended its rallying career on a high, managing seventh overall and first in Group 1 (both "Class 1" and "Production" classes) driven by Ryan and Nicholson. Triumph Dolomites continue to be used in many forms of classic motorsport today, with cars being campaigned on track, hillclimbs, rally stages and autocrosses in the UK, mainland Europe, and Australia, as well as the USA. The early Robin Hood S7 used the front subframe and mechanical components from any Dolomite, attached to a monocoque body made out of stainless steel. Later Robin Hoods were Ford based. The Latham F2 used Dolomite mechanicals (usually Sprints), but attached to a fibreglass sports car body. The Panther Rio was based on the Dolomite 1850 but was re-skinned with aluminium panels and had a completely revised interior. Also available was the Panther Rio Especiale, which used the Dolomite Sprint as a base. It was expensive, £9,445 for the Rio Especiale when, in February 1976, a Dolomite Sprint could be purchased for 3,283 and a V12 Jaguar XJ12 5.3 for 7,496. In total, 38 Rios were sold and were produced from 1975 to 1977. ^ a b c d e f "The cars : Triumph 1300/Toledo/Dolomite". Aronline.co.uk. Archived from the original on 29 August 2013. Retrieved 19 November 2013. ^ "Motor Show Review 1972 on 1973 Cars". Daily Mail. London: Associated Newspapers Group Ltd: 49 (Triumph Dolomite). October 1972. ^ "Saab 99 history at The SaabMuseum.com - a comprehensive and up-to-date history of Saab cars". Saabmuseum.com. Retrieved 30 September 2010. ^ "Classic Motor Monthly Archives - The Triumph Dolomite Sprint". Classicmotor.co.uk. Archived from the original on 13 March 2016. Retrieved 1 November 2018. ^ > Jasper Gerard (23 March 2010). "Classic Triumph Dolomite Sprint". The Telegraph. Retrieved 30 April 2015. ^ "Awards boost British car industry". vads.ahds.ac.uk. Archived from the original on 17 July 2011. Retrieved 6 February 2008. ^ "BL Press release and covering letter". M Barker. Retrieved 25 April 2015. ^ Piggott B., Clay S., Collector's Originality Guide Triumph TR2 TR3 TR4 TR5 TR6 TR7 TR8, page 312-5, 2009, MotorBooks International Company, ISBN 9780760335765. ^ "Road test: Triumph Dolomite 1300". Motor: Pages 2–5. 11 December 1976. ^ "Mixed-up inside but fast on the outside - Features, Motoring". The Independent. 20 July 2004. Retrieved 13 April 2009. ^ "Guest Dolomites Page - 1500SE". Mytriumphdolomite.info. Archived from the original on 16 November 2013. Retrieved 30 August 2012. ^ "Triumph Dolomite Sprint". classiccars4sale.net. Retrieved 19 November 2013. ^ "Practical Classics magazine". Practicalclassics.co.uk. Retrieved 13 April 2009. ^ "Morris Marina". retrocaricons.com. Retrieved 19 November 2013. ^ "Dolomite Sprint". Unique Cars. Retrieved 19 November 2013. ^ "HiQ MSA British Touring Car Championship". BTCC. 22 July 2002. Archived from the original on 16 July 2011. Retrieved 30 September 2010. ^ "1974 Spa 24 hours". Homepage.mac.com. Archived from the original on 17 April 2009. Retrieved 13 April 2009. ^ "1974 Silverstone TT". Homepage.mac.com. 26 September 1974. Archived from the original on 18 April 2009. Retrieved 13 April 2009. ^ "RallyBase". Rallybase.nl. Retrieved 13 April 2009. ^ a b "Tony Pond Rally History". Homepage.ntlworld.com. Archived from the original on 3 July 2009. Retrieved 13 April 2009. ^ "CTCRC 2011 PEMBREY RACE MEETING". Retro-speed.co.uk. Retrieved 30 August 2012. ^ "STT H&R Cup: Joachim Bunkus siegt sich zum Titel beim Saisonfinale auf dem Nürgburgring". Speed-Magazin.de. Retrieved 30 August 2012. ^ "The Converters". AROnline. Retrieved 19 November 2013. Wikimedia Commons has media related to Triumph Dolomite.